In Part I, I explained what Green Globe (GG21) is, what must be done to win its certification, and what are the benefits derived therefrom. In Part II, I focused on the program’s relationship with hotels in Latin America and the Caribbean (LAC), current and prospective. Here I’ll briefly discussed the other types of GG21 eco-certification for tourism are underway in the region. Finally in Part IV I’ll look at what individuals, governments (local, national) and other stakeholders can do to help influence the future of GG21 and similar eco-certification programs geared toward tourism — and in the process, encourage LAC hotels and related tourism businesses become more environmentally responsible. Other than the application to lodging (hotels, resorts, inns, etc.) of what Green Globe (GG21) calls the “company standard” (explained in Part I of this series) what else in Latin America and the Caribbean (LAC) has received or is in the process of receiving GG21 certification? In 2004 Green Globe launched a new eco-certification standard it likes to call “the international eco-tourism standard” (IES). 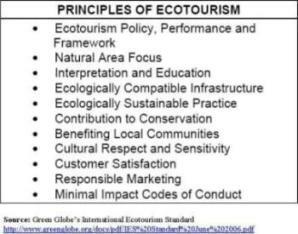 The tourism, environment and policymaking communities have been debating for many years what should and should not be able to call and promote itself as “eco-tourism.” “Eco-tourism” has become a buzzword used more and more in tourism marketing without consensus about its meaning and proper use, much less about concerning meaningful, comparable, certifiable standards. The IES was developed by Ecotourism Australia and Australia’s cooperative Research centre (CRC) for Sustainable Tourism based on a successful Australian eco-tourism certification standard. GG21 was given the exclusive license for its distribution and management. In a nutshell, the IES is an attempt to benchmark and certify that an operation does not just meet rigorous environmental management standards in its own internal operations, but also respects and benefits the local community and contributes in a meaningful fashion to local conservation and sustainable development efforts. So who was the first to be certified under this new standard? An eco-tourism project in Canada, the US, Europe or New Zealand? Or one owned or managed by a North American or European but located in a developing country? No. It was a Mexican project in the Baja peninsula owned and run by Mexicans. 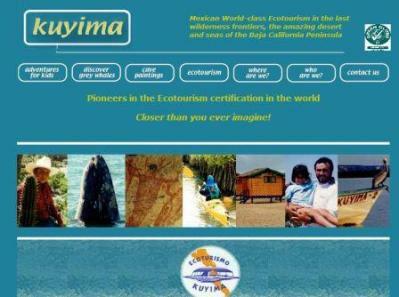 In fact, Kuyima sought and received three separate IES certifications: one for its accommodations, another for its whale-watching tours, and a third for its cave painting tours. The second IES certification was also from the LAC region! 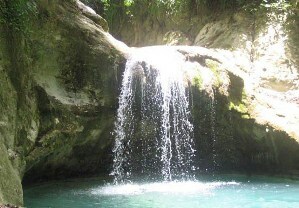 That certification was granted to the Rio Damajuaga Waterfall Tours in the Dominican Republic. Why Not More Certified IES Tourism Projects in LAC Nations? Green Globe’s International Eco-tourism Standard is relatively new, so it may take bit before enough of the “eco-tourism” businesses across the LAC region learn of its existence, requisites, procedures and fees and consider signing up for the benchmarking that begins the certification process. A big challenge for GG21 will be differentiating their IES from the many other eco-tourism certification standards on offer. There have been many “eco-tourism” standards proposed and launched over the years in Latin America, quite a few supported by aid agencies, multilateral banks, nongovernmental organizations (NGOs), well-meaning charitable foundations and national Tourism Ministries and institutes. Many of these have failed. Many have disappointed: ask some of the Central American tour operators and attractions that have gone through the trouble to get “certified,” only not to see it make a difference in their bottom-line (attracting paying tourists). More on these topics in a coming Temas blog — how best to bring some order and sense to the current cacophony of competing certification/labeling schemes, and how to fulfill the marketing promise of eco-certification for this sector. GG21 needs to demonstrate (1) its IES is better in both conception and execution than the other standards out there or in the works; (2) GG21 (or its partners in the region, such as CAST) can help awardees properly market their certification to draw in paying customers. I think there is a case to be made for the former; whether the latter is happening or will happen soon is still far from clear. In a nutshell, GG21 needs to create a brand recognized and sought by travel agents and travelers — it needs to become an eco-version of what the Michelin guide became for “traditional” tourism. And What About Those Other Certification Categories? More curious to me is the region’s lack of certifications in the non-hotel versions of the older company standard. For example, given the number of marinas, jet-ski rentals, sightseeing buses, golf courses, cruises, boating, rental care services, horseback riding and recreational fishing operations offered to tourists in the Caribbean region, why are none of them seeking certification? In some countries it may be that while the Tourism Ministry, tour operators and the local trade association has made the tourism sector well-aware of GG21 certification for hotels, they have not stressed other certification possibilities and/or the potential benefits thereof. In some it is because these same actors are pushing local programs under their control. In some places it may be because some NGOs are pushing their own standard or one that they endorse, which tends to favor businesses already partnered with them (NGOs with less than pure motives? yes, it does happen!). Some operators may have had a negative prior experience with one of the other certification schemes (there are many tales in the region of programs that made money for the consultants running them but not the certification recipients). All of which is why in my next blog installment on eco-certification for tourism I’ll address what everyone — certifiers, awardees, governments, travelers/tourists and other concerned stakeholders — need to do to help realize the full positive potential of a program like that offered by Green Globe. I really enjoy the way this blog was written. well, I look forward to all the updates, Thanks again. I concur. This is blogging at it’s best and I hope MyBlogLog can help grow its audience.